It's quite a leap from asparagus to samphire in the scheme of things but we have been very busy moving up to the North Norfolk coast. The deep joy of picking ones own samphire is audible. I love eating it for breakfast with poached eggs, just missing out the salt and using unsalted butter to enjoy the simple sea saltiness of the samphire. I don't steam or fry it but just add it at the end to the hot potatoes to warm through, I like the crunch and rawness of it along with the soft garlicky buttery potatoes. Boil your potatoes until just done. In another pan melt your butter and add garlic until it begins to soften and release it's aromas. Then add your drained and hot potatoes into the butter with the flat parsley and samphire with a lid on the pan give it a firm shake. I like to add a few flakes of chipotle chili to mine, a nice pan fried piece of hake would also be a fine idea. 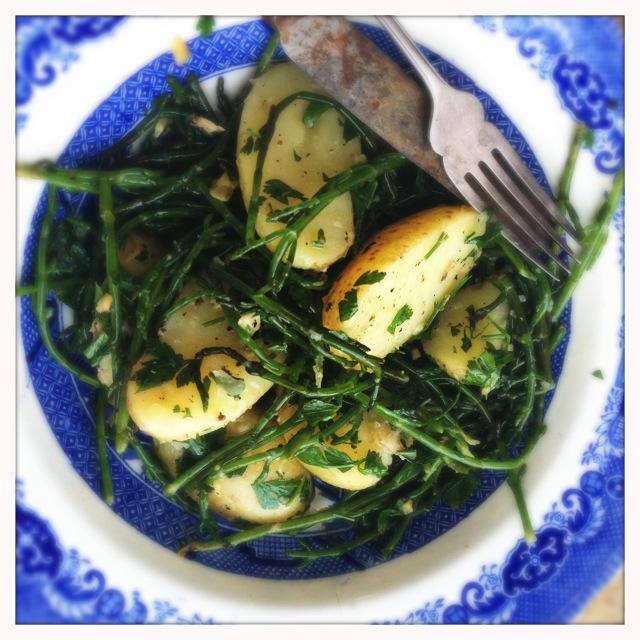 I bought the new potatoes from the road side for 50p and the samphire was hand picked by me, the parsley from my garden so all I bought was the garlic and butter, I am guessing this simple and delicious supper must have cost about 70 pence.